Stretch marks are pink, red, purple or white lines on the skin that occur on the abdomen during pregnancy and are called striae gravidarum. Stretch marks or striae also can occur on the shoulders hips, thighs and buttocks during unusually rapid body growth and weight gain during adolescence and may be related to excess hormone stimulation during puberty. The use of steroid medications can also cause striae on the body. Use of performance enhancing steroids by athletes and bodybuilders can also produce stretch marks or striae. Stretch marks or striae are caused by breakage or tearing of the deep dermis layer of the skin caused by rapid skin expansion as in pregnancy. When the collagen layer of the dermis breaks or ruptures the skin surface has lost its support and the skin of the stretch mark becomes very thin, spreads, and the stretch mark becomes wide. Early stretch marks are pink or red colored, occasionally purple, but old stretch marks are white. How do you get rid of stretch marks? The only non-surgical method for removal of stretch marks that is FDA approved for stretch mark removal and that I have seen actually work is the non-surgical fractional 1540 erbium laser treatments. Nonsurgical fractional 1540 erbium laser treatments alone are used to treat fresh, new or acute pink or red colored stretch marks. Older or chronic white stretch marks require a combination of non-surgical fractional 1540 erbium laser treatments and infrared skin tightening treatments such as the Lux IR Deep. 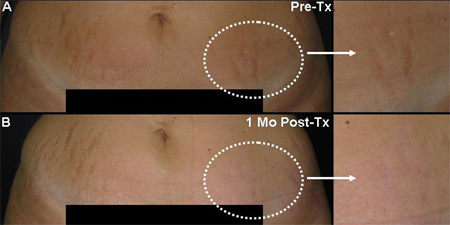 Ablative laser stretch mark treatments can actually make stretch marks worse and thinner and should not be used. Stretch marks can, in some cases, be removed surgically as part of a tummy tuck or abdominoplasty. What is the best laser treatment for stretch marks? The best laser treatment for new pink or red stretch marks is non-ablative fractional 1540 erbium laser treatment. The best treatment for old white stretch marks is a combination of non-ablative fractional 1540 erbium laser plus infrared treatments with the Lux IR. Yes non-ablative 1540 fractional erbium laser treatments do work when done by an experienced nurse, PA, or medical aesthetician under physician supervision or when performed by a physician. Older white stretch marks require a combined treatment with the non-ablative fractional 1540 erbium laser and the infrared skin tightening treatment with the Lux IR Deep. Will a stretch mark cream work? In my experience stretch mark creams produce disappointing results. It is understandable when you realize that removal of stretch marks requires rebuilding and new production of collagen in the deep dermal layer of the skin. It would be very difficult for any topical skin cream to cause enough new collagen production in the dermis to improve a stretch mark. Who should do my laser stretch mark removal? In Massachusetts, laser stretch mark removal treatments can be performed by a nurse, PA, or medical aesthetician under the supervision of a physician. In some practices physicians do the actual laser stretch mark removal treatment. If stretch marks are causing you to feel self-conscious about your appearance, laser treatment from Dr. Brooke Seckel can help. Dr. Seckel is a top cosmetic surgeon in Boston, MA, who has helped many patients enhance their appearance and self-confidence. Schedule a consultation with him today by calling 617-455-2859, and learn more about your treatment options.